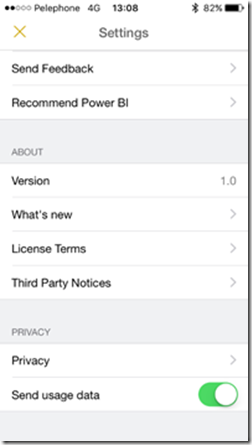 We are happy to share notes for the latest release of Power BI Mobile apps. 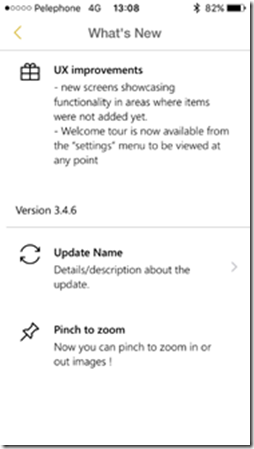 This update includes some new and exciting capabilities, expansion of existing features, and extended support of features in additional platforms. Want to let us know what you think of these changes or have an idea for future development? Don’t be shy – we want to hear from you on our mobile feedback forum. 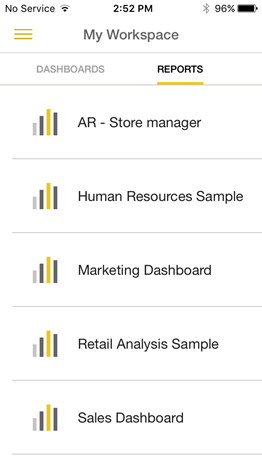 In last month’s update we added the ability to drill down into reports from a tile. In this update, we are expanding the reporting capabilities so you can access your reports directly from the main menu. Now you can easily find all of your data, even if it’s not present on the dashboard. Simply open the menu, select your favorite report, and start exploring! 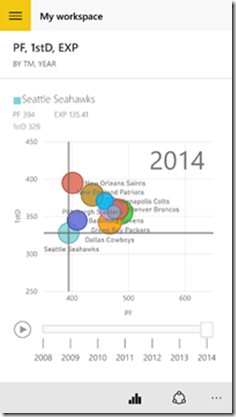 As Power BI becomes more popular in your organization it might be more difficult to find a specific data point. That is exactly why we are happy to introduce two features that enable faster access to your data: recent items and global search. Both of these new capabilities can be found under the magnifying glass icon in the top right-hand corner of your screen. Tap the icon to see a list of your recently viewed items. 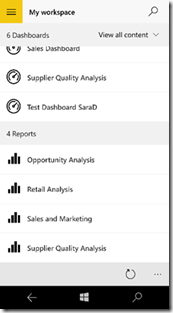 If you are regularly using the same reports or dashboards, you can find them quickly with this list. The new global search allows you to search for dashboards, reports, and groups by name. Simply start entering your search terms into the input field and results will instantly appear. Search results are separated by type, which means you can narrow your search by selecting a specific type of result on the search result ribbon.These two features make it even easier for you to find and access the data you need on your mobile device. 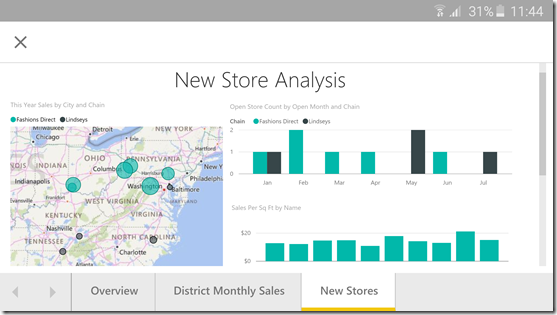 In case you missed it in our standalone blog post, the Power BI Mobile app now automatically updates your dashboards every couple of hours, so you can access near-fresh business intelligence while offline. 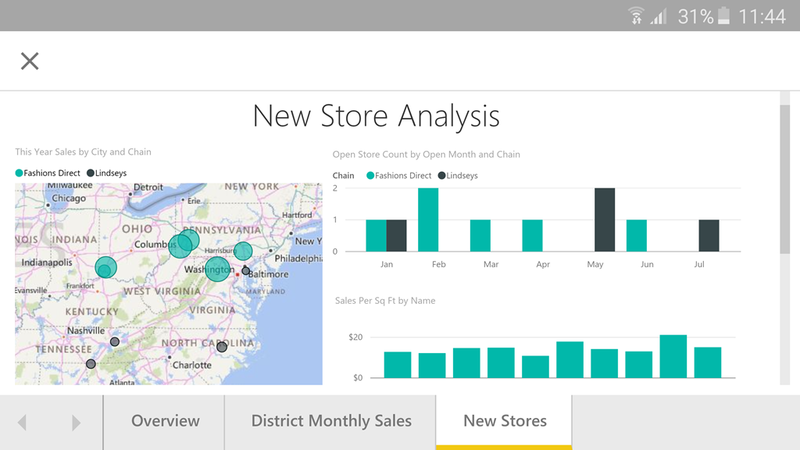 Bing dashboard tiles, dashboard widgets, R visuals, and real-time data tiles are now supported in focus mode. Open any of these tiles from your dashboard to see a larger view with greater detail. The March 2016 mobile app update features improved scatter chart animations. 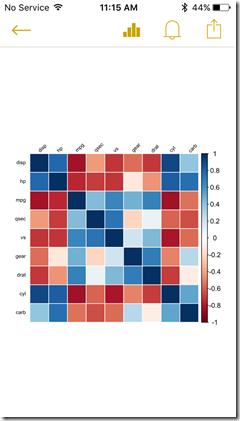 Open your scatter chart and hit the play button to see your data come to life. 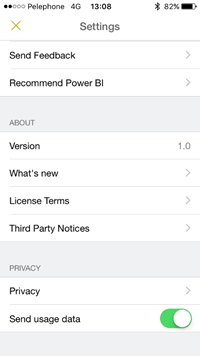 Starting with this release, we’re adding a “What’s new” screen to Power BI mobile apps. Here you’ll be able to see all the new features and changes in the app, including a short description and (when available) links to learn more. 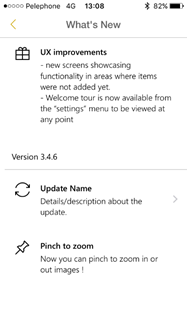 This screen will appear after every update and is also available from the Settings menu. 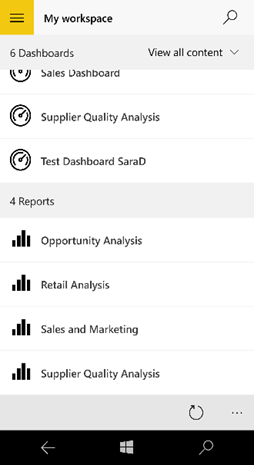 Following the announcement on iOS and Windows 10 we are happy to include Android users in those who can open and interact with reports on their phone. 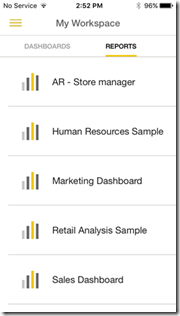 Drill down into a tile from the dashboard to view and interact with the source report. We have added support for Intel Chipsets on Android, allowing phones such as Zenfone5 devices to install and enjoy the Power BI app for Android. We also expanded our support for Android 6.0 Marshmallow OS, including the ability to toggle application access for camera, contacts, and voice.